(a) Inspect the mirror switch continuity. Turn to the left/right adjustment switch to the L position. 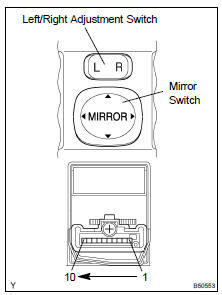 Inspect the left side mirror switch continuity. Turn to the left/right adjustment switch to the R position. (b) Check operation of the mirror heater. Check the mirror between terminals 7 and 8 of the connector. Check that the mirror is warmed up when connecting the battery positive (+) to terminal 7 and the battery negative (-) to terminal 8 of the connector. (a) Inspect operation of the mirror motor.